I have cleaned the throttle housing and replaced the Motion pro cables but still have this problem . When the bike is off , You can open the throttle and it snaps closed easy peezzy but when you start the bike and its idling and you open the throttle and let go it hangs up about 2000rpms then drops , When your riding and shift between 1st & 2nd that hang up causes a hard clunk gear shift as if you just speed shifted into 2nd without letting off the gas , Same when your riding along and let go of the throttle it keeps motoring a second before deceleration , Almost like a vacuum is holding it open ? Just out of curiosity why is that air line plugged? JRZ7285 wrote: Just out of curiosity why is that air line plugged? I checked the manual and found its the fuel overflow , The one that sits in the rubber pad under the tank , Dont know why its plugged , PO had it that way , Dont believe its the problem since its not a vent tube , Suggestions say I should check the throttle slide might be hanging up , Never in my 47yrs have I had that problem but I guess its worth a look . My idea also, is it? He is talking about that little cover on the LHS - take it off, watch the spring & diaphragm behind it, and inspect the cover itself. There's small/tiny hole in it which you better plug with a droplet of epoxy-glue. This will disable this silly, environmental system... which perhaps has the diaphragm torn or deteriorated? If so just plug the hole, put back the junk and forget about it. Ive got the same damn problem you do. bike hangs at high idle then eventually drops. Checked cables, valves, jets are not clogged, no air leaks, adjusted fuel screw and tried multiple configurations with plugging the air cutoff valve. still doing it. if you google XR650R high idle you'll see this is a common problem with no exact cause. some (like myself) have tried everything short of buying a new carb, others have had success with a valve adjustment or plugging the ACV, some have even had the issue go away on its own which is what I'm hoping for. Guess you could unhook the cables from the carb and just be 100% sure it's not them ? Here's another take on this phenomenon. First, make 200% (yes, do it twice) sure that the valves are set correct (remember the auto-decomp system!). 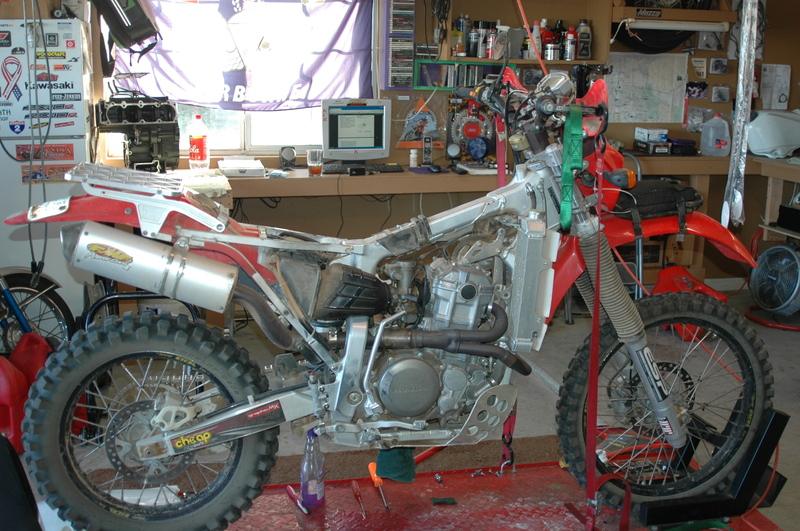 Then, idle the warm/hot bike sitting vertical on a stand (and run a hosepipe over a radiator to keep it cool enough). Then wave a gasburner withOUT flame (if you want to keep your bike that is, otherwise burn it to ashes) but with gas only over the intake manifold, the rubber bung between head & carb. If the revs pick up you've found the problem, renew the intake rubber. Had similar problem and it was resolved by making sure to perfectly align the cables with carb to prevent a slight binding that was occurring. 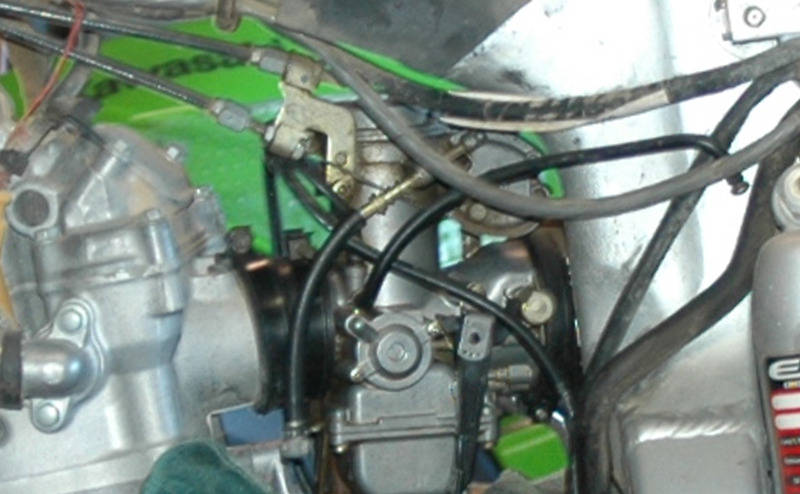 Also make sure the push/pull cable adjustment on the carburetor is just right. This cleared it up for me. To test this when the idle is hanging manually fully close the carb and see if the idle drops.